I’m not a massive fan of red top newspapers. But The Sun, whether it was the one “wot won it” or not, is massively influential, including (and especially?) amongst Labour voters. Labour voters are one of the key constituencies that will ultimately sway the EU Referendum. 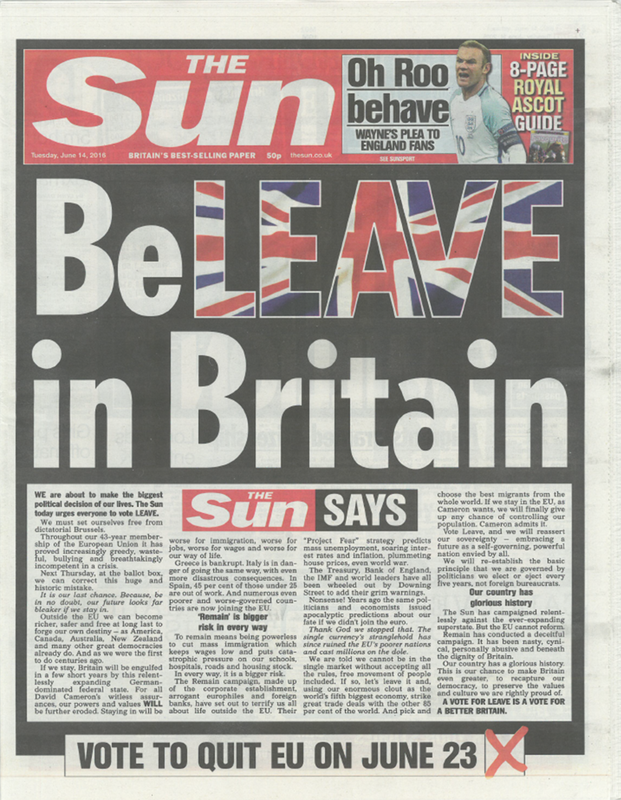 Therefore, as someone who is strongly in favour of Vote Leave, aka Brexit, I am really happy that The Sun newspaper has decided to come out and back LEAVE (see yesterday’s front page above: click on it for a close up). I also think the front page strikes a good balance and fairly plainly puts forward a largely positive case. The headline says it all: Believe in Britain. Or as Bremainer President Barack Obama would have had it, YES WE CAN! We are a great country, with a great history and a great future. Brexit is not retreating into glorious isolation; this is our chance to break free and into the wide open world and fully unleash our potential. BeLEAVE in Britain: a vote for LEAVE is a vote for a better Britain.